For my third day in Coron, I was again fortunate to be granted with a good weather so I was able to get a Coron Island hopping package that includes Malcapuya with Calamianes Expeditions and Ecotours. Malcapuya Island’s location is near the open sea so island hopping activity needs weather permission and the agency properly monitors it for their guests’ safety. Panoramic shot of Banana Island. We left the port around 8:30 and travel time to Bulog Island was about an hour and a half. 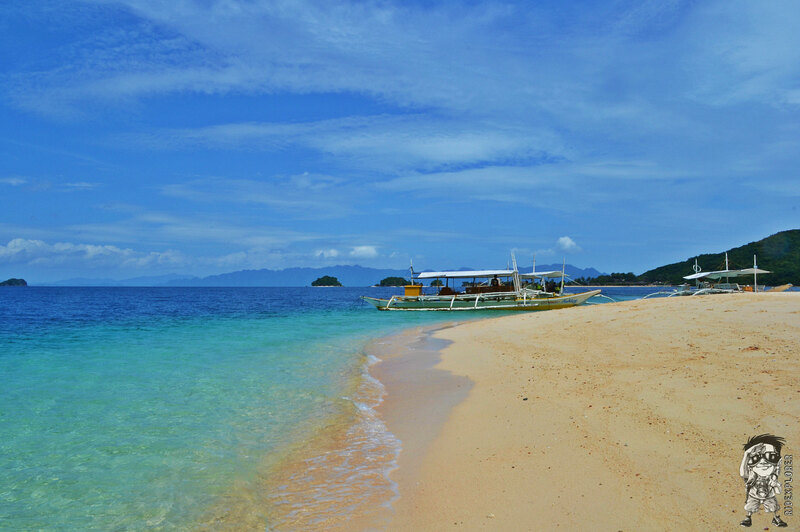 Bulog Island is composed of two islets connected by a short sandbar. 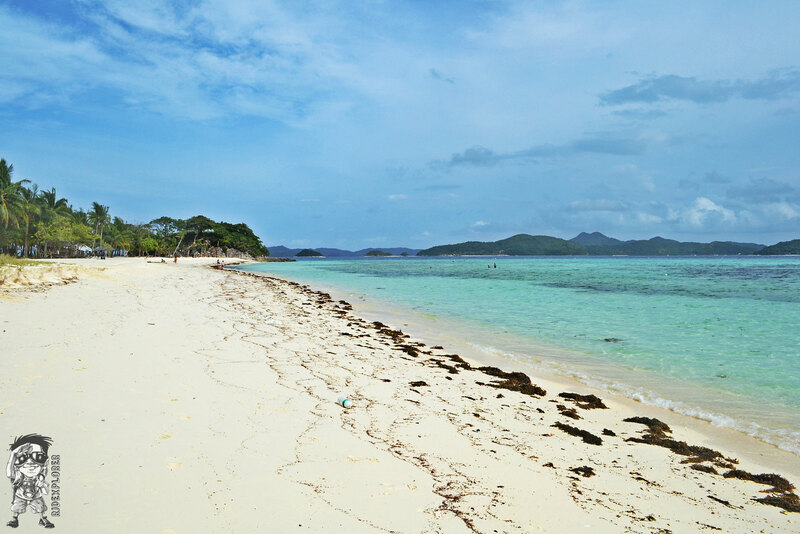 The whole island is also connected to the Two Seasons Luxury Beach Resort by another sandbar during low tide and dry season. Sand is not that fine but white while water is crystal clear. There are rocks of the rightmost part of the island which is a perfect background for a souvenir photo. 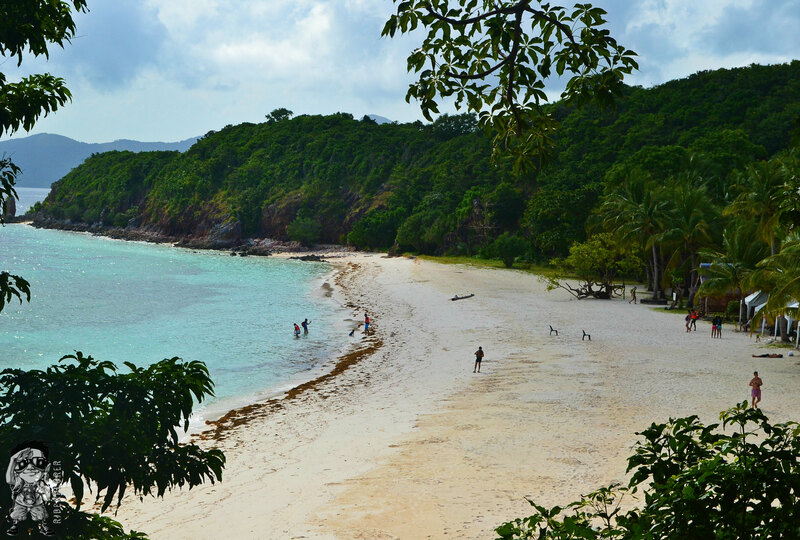 You can also get an aerial view of the island and the nearby resort by trekking to the deck of one of the islets. We spotted some fishes specifically clown fish near the shoreline. After we swam, we stayed at the cottage for a while before hopping on our boat to the next island. At the rear side of Bulog. Next Island is the Banana Island where we had our lunch. As per the boatmen, it was named as such because the tropical fruit is abundant in the island. We had a sumptuous meal feast on steamed crabs, grilled fish and chicken, seaweed (lato) salad and ensaladang talong (eggplant salad). Banana and Bulog islands are not included in the Malcapuya package rate and it requires an additional of Php 250 per person and depends on the decision of the whole group. But I do suggest that you add those islands since you’re already there and they are great ones to visit. Banana Island has the best underwater marine life compared to the other 2 so better prepare your snorkel and an underwater camera to be used. You can already have a sight of colorful corals and magnificent underwater view just meters away from the shoreline. The corals are shallow that I was worried that I might touch them or scratch my feet while mobilizing on the water. I was able to take a video but haven’t got a nice photo (blame it on the Aquapac pouch and the iPhone). The snorkeling area available in the island is vast it’s just that I felt cramps on my left leg so I went off the water after 20 minutes of snorkeling. Some snapshots on the marine life in Banana Island. 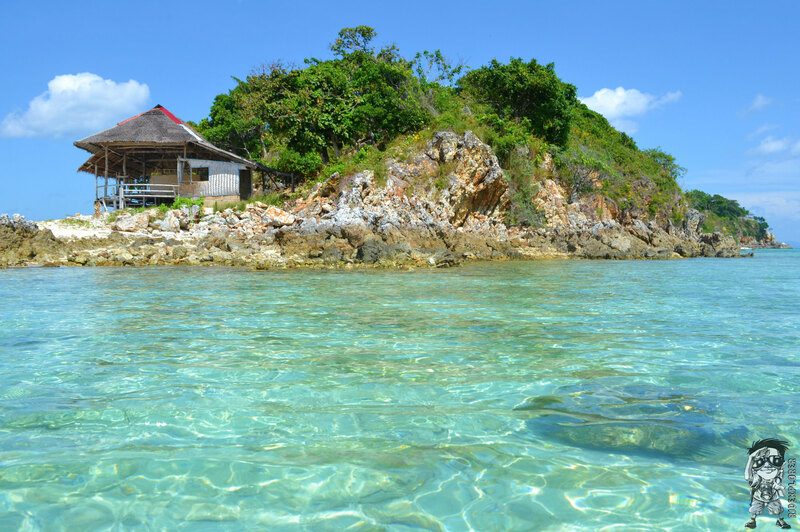 When everyone already satisfied with the marine life in Banana Island, we then hopped on our boat for the finale and last destination on our itinerary which is nearby, Malcapuya Island. Boats dock on the rear side of the island, not on the long stretch of white sand. The sea floor on that part is full of plants (don’t know what they call it) but water is clear. Everyone on the group went directly to the white sand beach while I made my way to the view deck where I got an aerial view of the island. The view the part where the boats dock has really a nice view! Area where boats dock in Malcapuya Island. 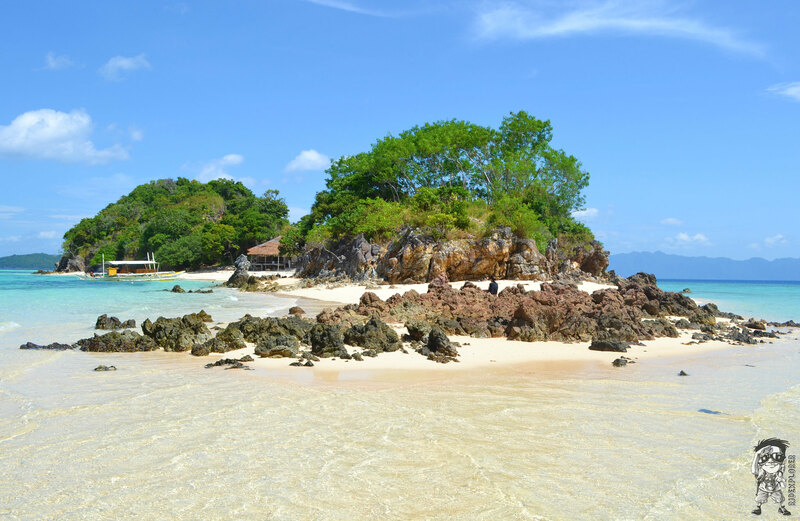 Malcapuya Island is being compared to the beach of Boracay as what I’ve read on some blogs and features. Can’t compare it though since I’ve never been to Boracay yet (not on my list, for real!). What I just saw is that the island has realy powdery white sand and sparkling clear water. Stretch of the white sand beach of Malcapuya. We didn’t swim since there were seaweeds on the shoreline. As per our mates, they spotted some giant clams a bit far from the shore. We’re too lazy to go snorkeling so we just sat on the sand all throughout our stay in the island. Panoramic shot of Malcapuya Island. After more than an hour, we decided to leave since a group of dark cloud was approaching. It was in the middle of the boat ride back to the port when a heavy rain caught us. We were all drenched and chilling with the cool winds while on the boat. It was still raining when we got back on the town proper. New found friends doing their muni-muni moments: Angel Locsin and Heart Evangelista. 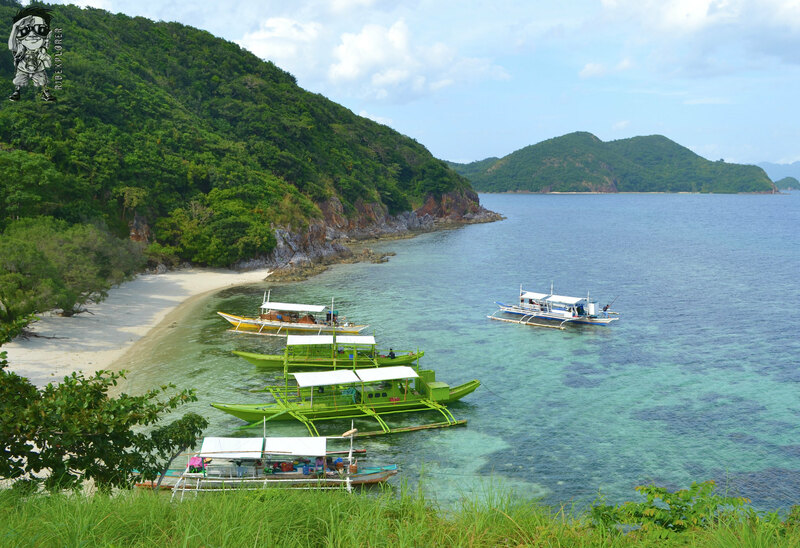 The Malcapuya Package Tour costs Php 950 that will include the licensed tour boat, islands and entrance fees, picnic lunch, and use of cottage. Booking a tour with Calamianes Expeditions and Eco-Tours is really a great idea especially for joiners. You will be able to experience the attractions of Coron worry-free and still affordable, get to help their local partners and most of all, meet and gain new friends. Aside from that, they also provide Private Guided Tours wherein you will get to enjoy the sceneries of Coron just together with your loved-ones. You can inquire at www.coronpalawan.ph for more details.